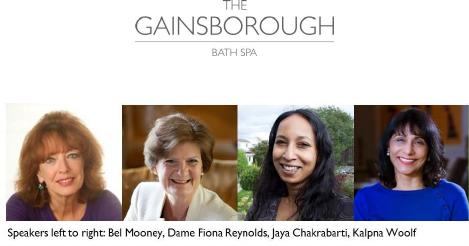 The Gainsborough Bath Spa hotel’s series of inspirational talks by high-profile business women is to return for a second year with the aim of celebrating, supporting and inspiring. 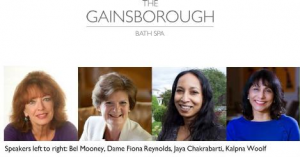 Following the success of 2018’s Phenomenal Women talks, The Gainsborough Bath Spa has teamed up again with the University of the West of England’s Business School to stage the four events. Business West, the organisation that runs Bath Chamber of Commerce, is also supporting this year’s series of talks, which take place between February and November. Each will be delivered by a high-profile businesswoman who has innovated in her field and achieved widespread recognition. Each woman will talk about the obstacles and lessons she has experienced on her route to success. April 10: Dame Fiona Reynolds – Master of Emmanuel College Cambridge and former director-general of the National Trust. Dame Fiona Reynolds DBE became Master of Emmanuel College, Cambridge in 2012. She came to the college after a long career in the voluntary sector, latterly as director-general of the National Trust from 2001-2012. During her time at the Trust, she made it warmer and more welcoming, bringing the houses to life and raising the profile of its work in the countryside. Before that, she was director of the Women’s Unit in the Cabinet Office (1998-2000), director of the Council for the Protection of Rural England (now Campaign to Protect Rural England) from 1987-98 and secretary to the Council for National Parks (now Campaign to Protect National Parks) from 1980-87. June 12: Jaya Chakrabarti MBE – Social and business entrepreneur. Jaya is a passionate advocate for engaging business with community through technology to improve people’s lives and received an MBE from the Queen in 2014’s honours list ‘For services to the creative digital industries and the community in Bristol’. She co-founded digital agency Nameless in 1999, which became one of the leading creative digital agencies in Bristol. Following her MBE, Jaya set her sights on tackling modern slavery using open data, bootstrapping her social enterprise TISCreport.org (Transparency In Supply Chains Report) to Nameless. TISCreport.org launched in 2016 and is now the world’s largest anti-slavery register. November 14: Kalpna Woolf – head of production at HungryGap TV Productions and author of Spice Yourself Slim. Kalpna is a major influencer for change in our region – both at senior board level and at grassroots level. Following an award-winning career in the BBC, as Head of Production overseeing £100m global business including the BBC’s jewel-in the-crown, the Natural History Unit, Kalpna now works extensively with the creative sector in both an advisory and consultancy capacity and is currently Head of Production at HungryGap TV Productions. Alongside this, she held positions on business and charity boards including chair of trustees for Frank Water, trustee for Knowle West Media Centre and business advisor and chair of the Skills Group to the West of England LEP board. She is now a member of the Bristol and Bath Regional Capital Board, attracting significant fund into the region for social enterprise projects. After devising a Masters’ programme in Production Management in the Media for UWE, she was awarded visiting professorship for the Faculty of Business and Law and is now on the governing board for UWE. Intent on redressing the gender and BAME balance on business boards, Kalpna has set up BeOnBoard. It is an indisputable fact that diversity is correlated with both profitability and value creation and that inclusion and diversity delivers competitive advantage and is specifically as a key enabler of growth. Tickets for each event are £15. Attendees will be welcomed with prosecco and canapés, giving them the chance to network with one another before hearing from one of the ‘Phenomenal Women’. The talks will be followed by a guided discussion from a member of the University West of England’s Bristol Business School. The series takes its name from the poem Phenomenal Woman by US poet Maya Angelou. The multi award-winning five-star, 99-room Gainsborough Hotel opened three years ago. It was the first UK hotel to be opened by YTL Hotels, part of the giant Malaysian YTL conglomerate that also owns Bath-based Wessex Water.